The Kingdom of Bhutan is a tiny nation perched high in the Himalaya Mountains in Asia, but it has one of the emerging silver bullion coin collections sought by investors and collectors around the globe. The Happiest Lunar Coin Series is produced and marketed for the Kingdom of Bhutan by the Singapore Mint and features its third release with the Year of the Dog design. 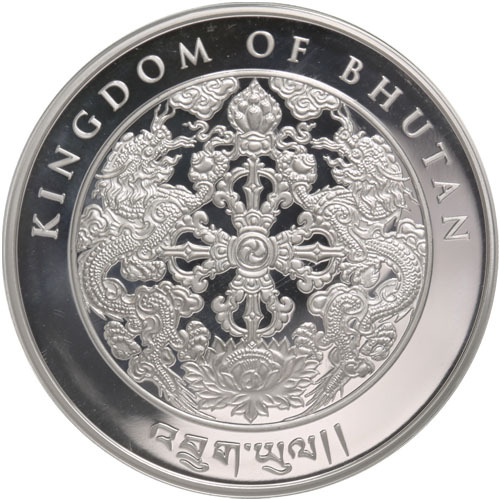 Today, 2018 1 oz Silver Kingdom of Bhutan Lunar Dog Coins are available to you online at Silver.com. Available to ship inside of individual protective plastic capsules! Third coin in the Happiest Lunar Coin Series collection! Mintage limited to 200,000 coins only! The face value of 200 (Nu) is fully backed by the Kingdom of Bhutan. On the obverse side is a stylized Year of the Dog image. The reverse includes the artistic version of the emblem of the Kingdom of Bhutan. Issued by the Singapore Mint. The Happiest Lunar Coin Series from the Singapore Mint was first issued for the Kingdom of Bhutan in 2016 with the Year of the Monkey design. The series, like other lunar collections, will run for 12 releases through 2027 and includes new designs for each of the 12 animals on the Chinese Lunar Calendar. All of the 2018 1 oz Silver Kingdom of Bhutan Lunar Dog Coins in this listing come with a protective plastic capsule to house the individual coins. The coins in this series are available in Brilliant Uncirculated condition with mintage caps established by the Singapore Mint. Each coin has a face value backed by the Kingdom of Bhutan in the local currency of Ngultrum. 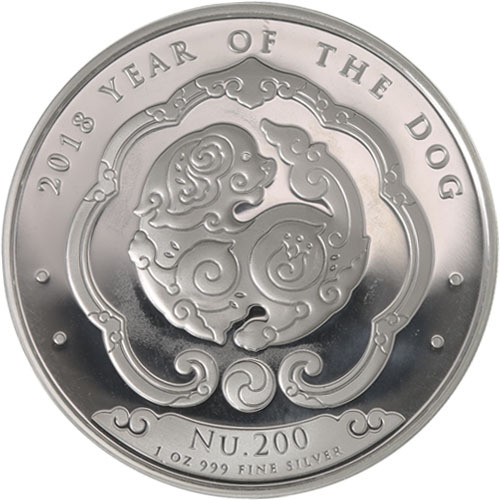 On the obverse of 2018 Silver Kingdom of Bhutan Lunar Dog Coins is the image of a Year of the Dog tribute. This detailed design includes florals, leaves, and clouds within the imagery of the dog. These are there to reflect the natural beauty of the kingdom. The overall shape of the dog in the design is meant to represent the “Ruyi,” with the paws symbolizing a blessing of good fortune. The reverse of 2018 1 oz Silver Kingdom of Bhutan Lunar Dog Coins includes the national emblem of the Kingdom of Bhutan. It is intricately engraved on this side and features alongside inscriptions of the nation of issue both in English and the native Sino-Tibetan tongue, Dzongkha. Please don’t hesitate to reach out to Silver.com with questions when you buy silver. You can call us at 888-989-7223, chat with us live online, or simply reach out to us via email.